Bottle top hat is shaped like a cone w/ a circumference of 24"
Pass the ketchup, please! 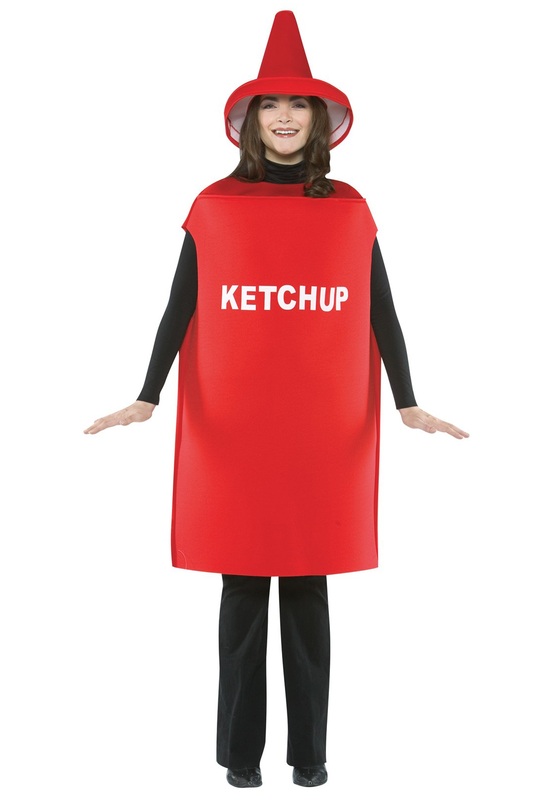 You’ll be in high demand on Halloween night or at any party with this goofy Adult Ketchup Costume. You really love ketchup, don’t you? It’s good to have a favorite condiment. You could get a friend to come along as mustard or go solo. But be prepared––wherever you wear this fun red outfit, people will ask you for a little squirt here or there. Go ahead––pop off your top and show ‘em what you’re made of! High fructose corn syrup and vinegar, you say? Seems the main ingredient should be tomatoes, but if that’s what tastes so good on everything from fries to meatloaf, then sign us up! This fun costume makes a great addition to any group of food costumes as well. In case you’ve never had ketchup but would still love to make use of this costume, here are some suggestions of costumes for your cuisine companions: chicken nuggets, tater tots, cheeseburgers, mayo, fried eggs, hot dogs, onion rings, hash browns… the list goes on. When in doubt, most fried versions of meat or potatoes are a good bet. This Squeeze Bottle Ketchup costume includes a giant red ketchup bottle suit with “Ketchup” written across the front in white––no brand-name Ketchup for this budget-conscious shopper––with holes for your head, arms, and a big one for your legs. So don’t go getting 3 year’s worth of ketchup at Costco and try to put it in this, because it won’t hold it. There’s a 24 inch-wide hat shaped like the ketchup bottle’s lid to top it all off.